Whenever I hear a new secondhand bookstore is opening, I always like to be one of the first in line on opening day. That way I can scoop up all the number ones on offer, along with find any holes in my collection from their debut offerings, before anyone else beats me to it. Recently my birth town of Whakatane was home to just such an event, and here are four of the picks I grabbed. THE SPECTRE #1 Writer John Ostrander wrote two titles in the 80's that never date. Suicide Squad and this, his run on The Spectre with artist Tom Mandrake. The mix of detective Jim Corrigan investigating the lives of the corrupt and criminal, with the dark and wildly imaginative punishments his alter-ego, God's Spirit of Vengeance inflicts upon his prey, makes for such a rich premise, each panel tears at your soul over the fact a Spectre ongoing has not been more of a constant fixture at DC. EXCALIBUR #1 Every time I finish an issue of Excalibur, by artist Alan Davis and writer Chris Claremont, I feel like declaring the work is better than any the fabled writer did on X-Men, and the first issue of their run is no exception. The humour, the quirky adventures and the interactions of the mix-matched team thrown into living together are all in fine form here, as Warwolves return to sniff out Phoenix - only to mistake Kitty for their prey. BREAKING THE FOURTH WALL: Nomad describes the issue's creative team too. Those Thing issues sure rocked, didn't they Dan? I must admit outside of the FF he never really rocked my boat and I only ever bought the old Marvel Two in One for who the co-star was, but Byrne really set the bar high here with this book. I could never get into this Secret Defenders tho, prob because of the ever-shifting ,membership and its too-similarity to the old Champions comic [at times it seemed as if it was the Champions mark 2]. That Ostrander/Mandrake Spectre run has been on many critics and fans list for top-notch team. Ostrander's tales really do merit a second and third look, as does his Martian Manhunter run, both of which are criminally neglected when it comes to full-out reprinting/trade-booking. 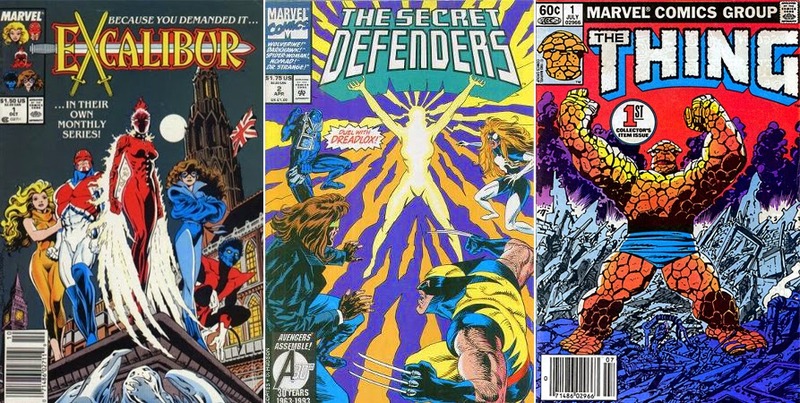 The Secret Defenders really are a product of that time and era, and suffer greatly for it. It could really be re-done well today, with a Jeff Parker, Cullen Bunn, Keiron, or or the like. And hey, more appearances by Darkhawk(and Sleepwalker too) is never a bad thing. Never read Thing's solo series, but Two-In-One was usually pretty solid in the same vein as Marvel Team-Up. Excalibur was a rare beauty of its time thanks to Clairemont and Davis. Definitely won't see an X-title like that anymore. Thanks guys! Karl, I think one of the things about umm Thing's solo series is people see him pretty much as a guy who hits things and not much else. I'd like to see how his days as a test pilot crossed himm over with the likes of Carol Danvers and a pre-X-Men Wolverine, play him up and show he was already a hero before those damn cosmic rays, yet keeping the plots kooky enough that they still have that Kirby feel in parts. Now that that whole royalty thing has FINALLY been resolved, that shouldn't be hard to do. DaleI second that Martian Manhunter was a great read, and they even sent J.J. down under for a few issues too, so that's always got to be commended. Mandrake's Image Comics series written my JMS and out now is also worth a nosey, you know, just to show true talent never ages. Darkhawk and Sleepwalker must be due a comeback of some form soon. With Marvel Cosmic going guardians at the moment, the mindscape and Darkhawk amulets can't be off the board for long! Hey Dan, did you ever read the 3 issue mini-series Before the Fantastic Four: Ben and Logan? It's got exactly what you just described, with Carol Danvers thrown in there. It's a pretty damn solid read, with some decent-looking art. ~I was just talking about Secret Defenders, and the rather inappropriate Dreadlox, in my last video... I'll have a blog post about the series soon... But I had a much more positive reaction to it all than you did. ONE STAR??? Come on! What's your video link King? Uhhhh- it's about two minutes into this vid: https://www.youtube.com/watch?v=Bk-cpVexZrc -I go on for a bit, as I tend to do. Nice one mate - watched the whole thing. And FYI Julia is my favourite too.